【明報專訊】A crow found a piece of cheese and flew to a nearby branch to enjoy his snack. Passing by was a hungry fox whose keen nose quickly picked up the delicious scent (香味) — where, oh, where was it coming from? Ah, there right overhead was a crow munching away (大聲咀嚼). "Ahem," said the fox with a polite cough, "Excuse me, aren't you Mrs Crow's little boy?" The crow looked down and recognised his old enemy, the fox. "Oh, it's you, the cunning fox! My mother warned me about you and how you cheated her out of her piece of cheese. Well, I'm holding tightly onto mine, so don't think you can outsmart (智勝) me!" "Oh, of course not," the fox agreed. "Anyone can tell at a glance that you'll never fall for that old trick." The young bird was pleased to hear such praise and continued to peck at his food. "What a pity that the starving widows and orphans have to go hungry today. The papa birds haven't come home, you see, and the little ones have nothing to eat. I have been scrounging around for something, anything, that could fill their poor, empty tummies..."
At these words, the crow stopped munching — suddenly, it seemed the cheese didn't taste as good as before. He began to feel rather guilty and asked the waiting fox, "Do you think I should share my cheese with them?" "Oh, what a kind, generous soul you are! Well, it's YOUR cheese, you're free to do with it as you wish. I really can't give you an opinion, my young friend..."
The crow couldn't bear the thought of the nestlings going hungry and so he dropped the cheese into the gaping jaws of the fox. "Mind you go straight to the starving families!" he called after the fox, who bounded off with a toss of the head. The bird flew home and told his mother what he had done. Shaking her head, Mrs Crow said sadly, "That sly fox, he cheated me because I was vain, and now he cheats you because you are softhearted. Is there no end to his cunning?" 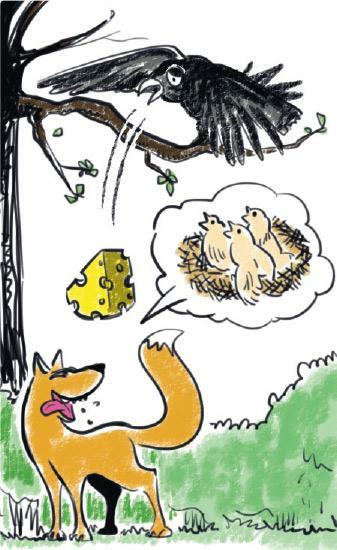 We are familiar with Aesop's fable "The fox and the crow". We seem to live in an age of scams (欺詐), schemes, tricksters, and conmen (行騙者), but actually, there have always been such people in any social group. They take advantage of human weakness to get what they want. How will you protect your family and friends from these scams? For each pair of words, which has a positive meaning and which negative?